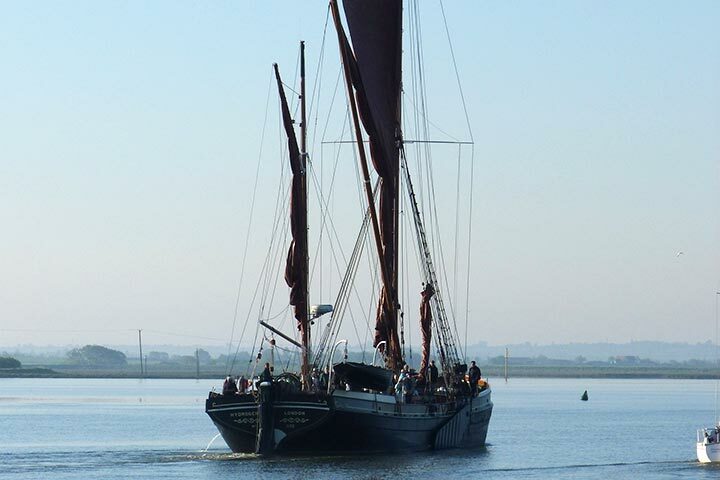 Turn back the clock and enjoy a great day out on a vintage sailing barge. 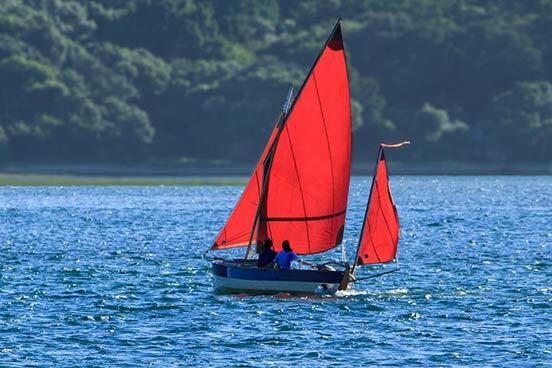 You and your partner will have a relaxing day out on this historic vessel, with the emphasis being on enjoying the scenery and the thrill of seeing these large vessels under sail. You will also have the opportunity to become involved in hoisting sails and steering if you wish. Time spent at the controls will depend on the skipper, weather, number of passengers and individual enthusiasm. A light lunch is included with this experience which is traditionally a cheese and ham ploughman’s with a delicious dessert. Eat and enjoy your lunch whilst looking out from this stunning barge. Please note the type of food available may vary depending on the time of year. This experience is available on selected Friday dates, generally March to October. The whole trip will last for approximately 4 hours. There will be up to 50 other people there on the day. Sorry, you can't take friends or family with you on this experience. The minimum age for this experience is 12 years old. Under 18s must be accompanied by an adult. You need to be reasonably agile to get on and off the ship. Please advise us at the time of booking if you have any food allergies. 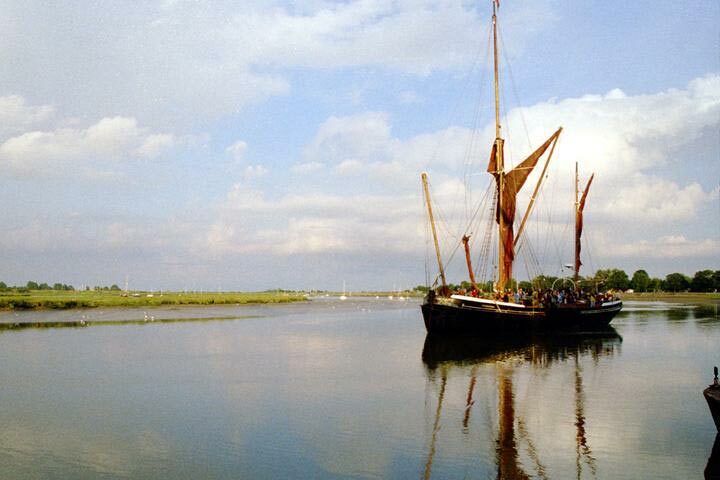 This was a lovely sailing trip from Maldon along the River Blackwater in a beautiful barge.The crew were very friendly and the substantial lunch was really tasty. Many thanks to everyone. I would definitely recommend this experience. My husband and I were treated to this experience and thoroughly enjoyed it. I would highly recommend it to anyone. The crew were lovely, the lunch was delicious and the whole day was thoroughly enjoyable. We booked this experience as it was local and of historic interest. It was very informative and a pleasant afternoon. Highly recommend. 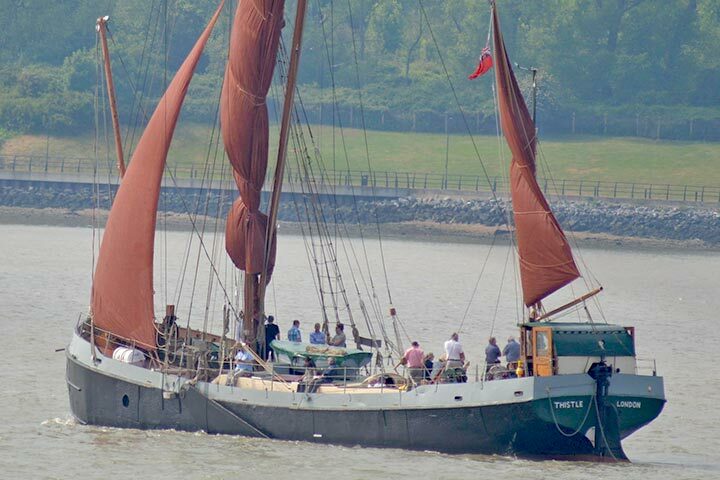 I chose this trip on a 100 year old Thames Barge as it sounded fun. It certainly was. It was one of the hottest days of the year so it was wonderful to sail down the Orwell. Wonderful views, superb lunch, a knowledgable skipper, good company and skilled sailing. It was brillaint. Given as a Christmas Present. Had long weekend in Ipswich. Weather couldn't have been better. Brilliant crew and informative master. Very good ploughmans lunch given + dessert. Well stocked bar for drinks. Very enjoyable 4 hours. Would recommend to anyone. We had a great day on the river at Ipswich and would recommend this trip. the crew were excellent - knowledgeable and enthusiastic without overwhelming with too much information. The food provided was great, and impressive given the facilities available to prepare it! 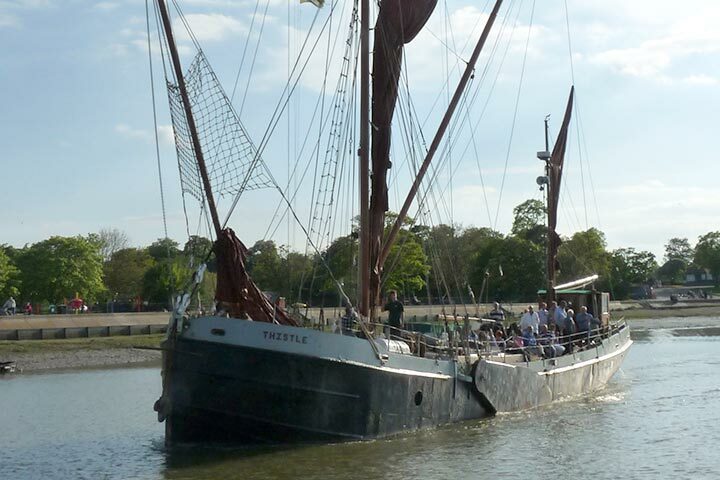 Lovely trip down the River Orwell on Thistle. The skipper was informative pointing out many other Thames barges that were moored on the river in readiness for forthcoming races. We were served a very good ploughmans lunch and the drinks were reasonable prices from the bar. Staff and crew friendly and helpful. This trip was a Christmas present from our daughter. It was lovely, we didn't know we were even moving on the water, very nice food too, it helped that it was a lovely sunny day. The Captain gave us snippets of info which was interesting too. Can I have one Dad? Thank you for taking the time to leave a 5* review for your Sailing on a Barge for Two experience. I am extremely pleased that you thought that it was such a great experience! If you ever fancy Sailing on another Barge, please get in touch and we can arrange it for you under a new one of our vouchers!